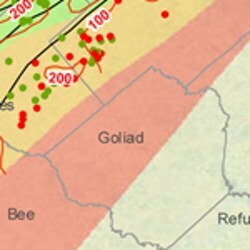 Goliad County (859 sq miles) forms part of the prolific Eagle Ford Shale play of South Texas. The county covers an area of the Eagle Ford Shale gas play that currently produces mostly dry gas. The county is not new to the oil & gas industry, but only produces minor amounts relative to the large volumes emanating from Eagle Ford wells. Current production is from many of the Gulf Coast's conventional sands in the Vicksburg, Wilcox, and Yegua. Generally, Eagle Ford drilling activity targets the wet gas window further north where well economics are supported by the production of more valuable condensate. Eagle Ford drilling where the geology favors the dry gas window will likely increase if natural gas prices warrant. County services of interest to oil and gas lease owners include the Goliad County Appraisal District (tax collector) office and the Goliad County Clerk (property records) office. The county seat is the town of Goliad. Other towns in Goliad County include Berclair, Fannin, and Weesatche. Join the Goliad County Discussion Group today - your voice counts! Charro Operating, Chesapeake, Legend Natural Gas, T-C Oil, and ExxonMobil (XTO Energy) are the largest producing companies active in Goliad County.